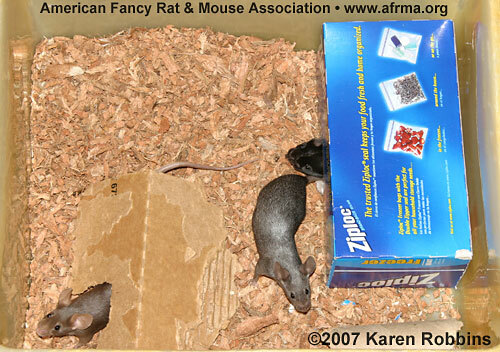 This article is from the WSSF 2008 AFRMA Rat & Mouse Tales news-magazine. 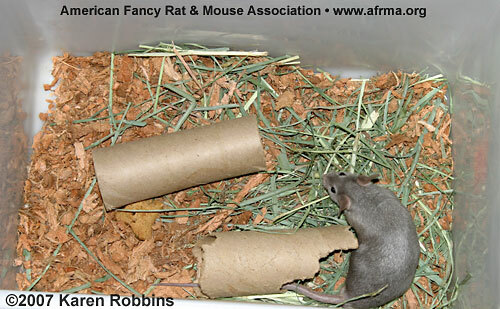 At one of our shows I was given some ground coconut husk reptile substrate to try in my critters‘ cages from a fellow AFRMA member who uses it in her rats‘ cages. It was in a plain plastic bag so I don‘t know the brand or details. This was used with my mice since it had already been tried out with rats. I put it in the freezer for a few days before I put it to use. A group of females on the coconut husk bedding before I put in the rest of their cage materials. Photo by Karen Robbins. This was a very surprising product to use. It smelled like bark mulch of course—something I would use in my garden—but was not unpleasant or strong smelling. It was lightweight and came in fluffy pieces that stayed together and didn‘t get shoved around the cage. I was told it would be dusty, and I would need to sift it. A single male on the coconut husk bedding. Photo by Karen Robbins. This lasted quite a long time in the couple single male‘s cages and the group of females‘ cages it was being tested in before it needed changing. It did eventually smell of ammonia when it got really dirty. The mice didn‘t seem to object to this new form of bedding. I was concerned about the red color staining the animals but didn‘t notice any coloring on the animals‘ tails or fur during the time they were on it. It is in big pieces so the mice were unable to make a nest out of it like they do with the aspen shavings. If you don‘t mind the “bark mulch” smell or the natural forest look to the cage, then it is worth trying. Make sure you freeze it first to eliminate any mites or lice that may be in the bedding.